Hopped on my first full suspension mountain bike the other day in Bolivia to descend 11,800 feet on the World’s Most Dangerous Road, a.k.a. Death Road. I went with the company that invented the ride: Gravity Assisted Mountain Biking. You’re just one slip on a nasty rock away from falling to your doom, talk about once in a lifetime! The reality is unless you are incredibly unlucky or reckless you’re pretty safe on the World’s Most Dangerous Road. Also when you’re getting your insides jumbled around for the first time over some melon sized boulders and get a glimpse of what looks like a never ending fall, it’s nice to know you are there with the best guides! Walk around Bolivia’s urban capital La Paz and you will be bombarded with different knock off companies doing the Death Road ride for a lot cheaper. I met quite a few tourists that had horror stories of having to use their foot on the tire to brake, bikes literally falling apart, and constant flats. If you ever find yourself in Bolivia make sure you go with Gravity Assisted Mountain Biking, it is worth the few extra bolivianos! They have higher quality bikes that are maintained, all the guides are bike mechanics, and the best part is they’re the only company to drive you back up the World’s Most Dangerous Road after the ride so you can really get a good look at what you bombed down! You can sign up for a ride with usually just a few days notice online or in person. I went down to the office in person and tried on helmets and gloves to make sure I got stuff that fit. A few days after I signed up we met at a coffee shop for breakfast before splitting off into two groups. We got in our vans to drive less than an hour to La Cumbre to start the ride. We were given our helmets, gloves, element proof jackets and pants, and free buff bandanas! The vans are equipped with optional full-face helmets, kneepads, and elbow pads if any riders prefer it. Our guide suggested going with less gear because sometimes it causes riders to rely too much on the gear instead of being a mindful rider. Our bikes were adjusted for size and any mechanical issues. Before we took off we all took turns toasting with 95 proof alcohol and spilling a little for Pachamama (Mother Earth) then on our bikes for a good ride. The rules were simple: be a responsible rider and don’t do anything stupid. Fast confident riders could go as fast as they liked as long as they stayed behind the guide in front and slow riders could take their time with a guide bringing up the rear at the last riders pace. No one was held back and no one was pressured to go fast. The ride started out on a paved highway so we could get a feel for our bikes. The spectacular mountain views were too beautiful to put into words. We stopped at a cliff where we were shown a bus that had gone over the edge on New Year’s Day and reminded to be safe and call out when we passed slower riders. We had to walk our bikes through a drug checkpoint and then had the option to ride on a slight incline. This was a real challenge because of the altitude: 15,000+ feet! 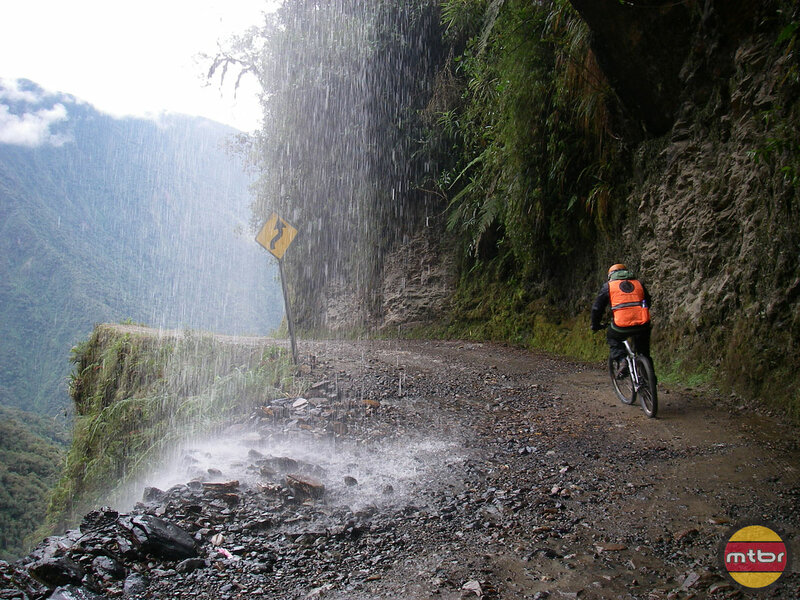 When we got to the beginning of Death Road we were reminded again to be safe and responsible riders. I can’t tell you how important it was to be told that over and over again. Many riders from other companies were out with us that day and they did some stupid things, sneaking up on slower riders without calling it out, riding recklessly, passing cars with cars in both lanes, and definitely relying on their safety gear a little too much. The World’s Most Dangerous Road used to be a busy road but a highway was eventually built as a safer alternative so very few cars and trucks still use it. 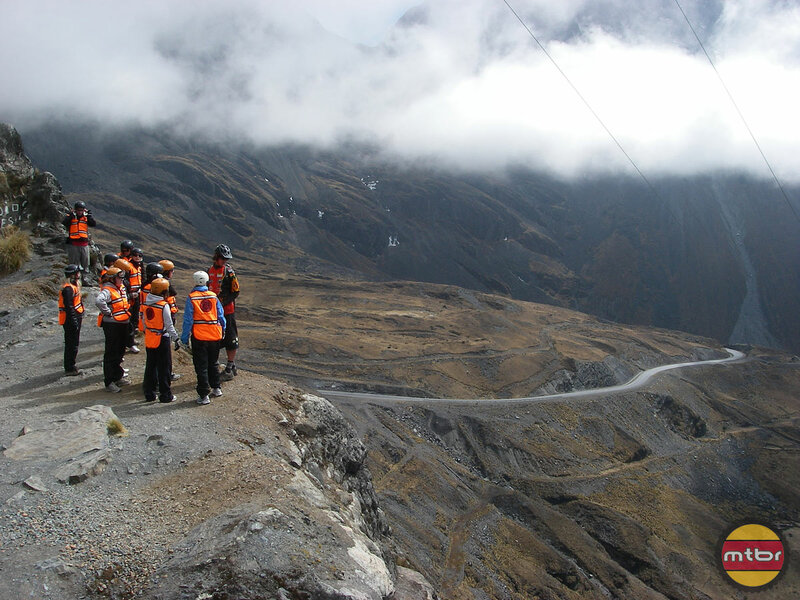 Bolivians are aware of the appeal Death Road has on tourists and usually give riders the right of way. However, when a vehicle approaches we are instructed to go to the left, which of course is the side with the drop! 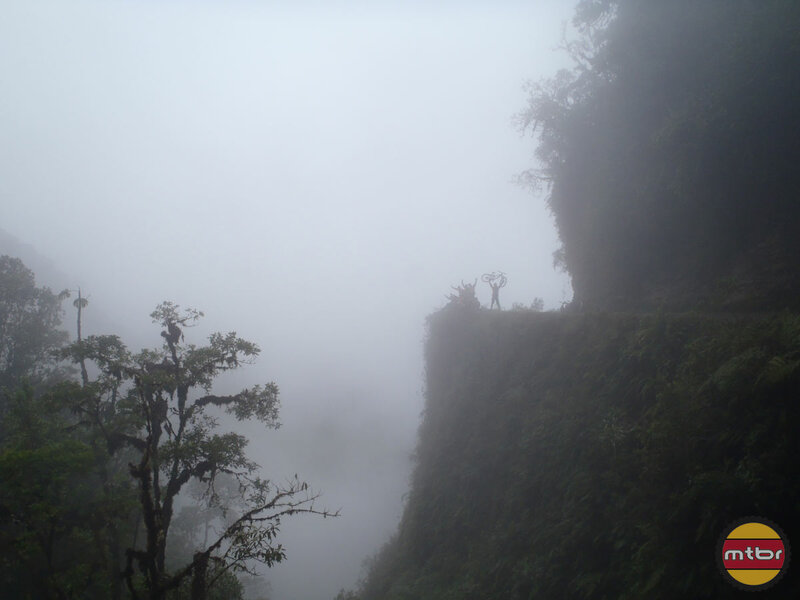 We rode single file along the edge of the cliff and everything down below was blanketed with fog. It was exhilarating and scary not be able to see the drops, some are sheer drops of 6,500 feet! We rode through waterfalls, stopped for pictures, and some of us had to learn very quickly how to make sharp turns on rocks! We had check points and our guide told us various stories about locals that had died on the road, the few houses along the way, general history of the road, and stories of people who had died riding. 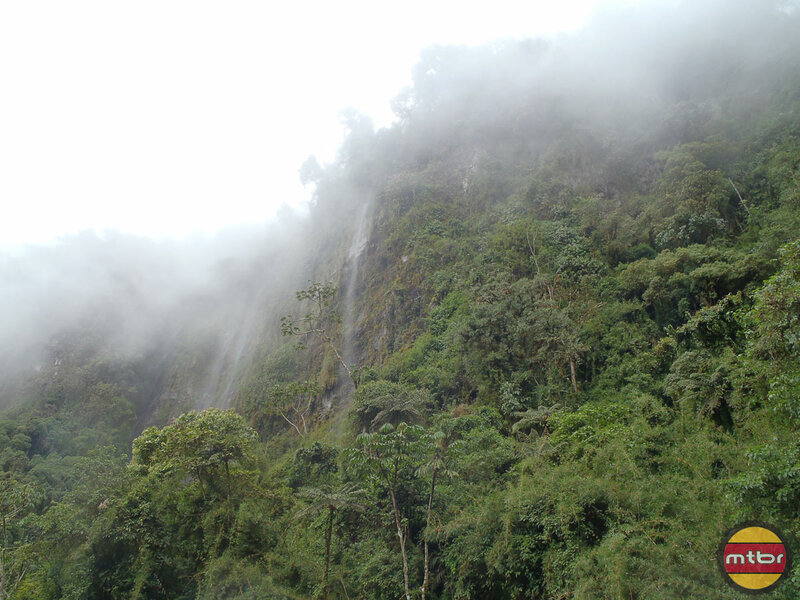 The scenery was breath-taking, everything green and lush, the valley of mountains below, houses perched in the middle of no where, waterfalls, birds, and a few kids! Dogs are wild and all over Bolivia and it was no different on Death Road. They sleep in the middle of the road and you have to go around them or get super close to hitting them before they move. The whole way down our van was following us with our stuff, food, water, extra equipment, and gear. We stopped for lunch, which is provided. There is a vegetarian option but I got the ham and cheese sandwich. A communal bag of potato chips were passed around and a big bottle of Coca Cola and cups. All of it tasted so good on the side of the road, everyone talked about things they saw and saying over and over again they could not believe the edge was so close on some of the turns. After lunch we took off and stopped shortly after. The temperature started to change suddenly as we descended some more. Our guide suggested we take off the jacket and pants we had on over our clothes because it would become humid in just a few miles. Not a minute down the road I crashed in my t-shirt! I was picking up speed over some very large rocks and trying my best to maintain control of my bike when I hit a rock just right and came thundering down over a sea of boulders! I fell to my right, did my best to roll, and got knocked in the head by the handlebars. I moved to the side of the road with my bike and let the other riders go. Road rash was all long my right side and back. The guide in the very back leaped off his bike and not far behind was the van. My guide and driver cleaned up my wounds, bandaged me up, and asked me if I wanted to keep going and I said yup and got back on my bike! Not long down the road it got startlingly hot and humid, it went from cool mountainous weather to tropical in no time. At the next checkpoint my group was waiting for my guide and me to catch up. We looked over a now tropical valley of mountains below covered in coffee fields. 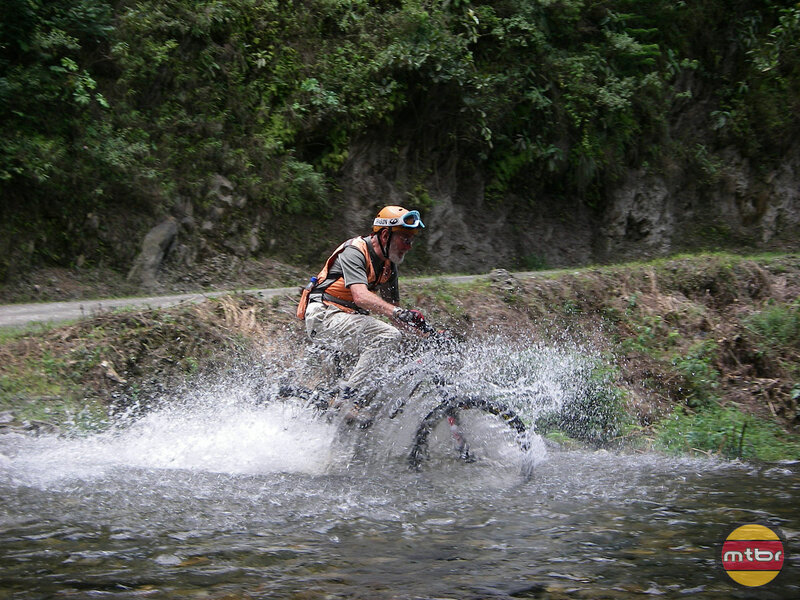 At some point in the last leg of the ride we rode through shallow flowing water which was trickier than it looked then reached a town called Yolosa where the ride ends. We took off all our gear and loaded the bikes onto the vans. There is a small store that sells snacks and sodas to all the riders at very end. There is also an option to zip line at an extra cost. After the vans are loaded up we have the opportunity to rest at La Senda Verde Cabins and Animal Refuge which was a real treat. We got a free glass of beer, buffet pasta dinner, hot water for showers, a t-shirt saying we went on Death Road, and the opportunity to meet a lot of cute and interesting animals! At the time when I went, a male monkey had been on the loose so the usual option to swim in the river was not available. Lots of parrots, monkeys, turtles, dogs, and mammals I can’t identify were allowed to roam free! Any food leftover from our buffet fed the animals and anything we bought from their restaurant went to helping the animals. It was such a fun and relaxing way to end our ride and I wished we had more time to spend there. There is an option to be left there to stay overnight or longer, which I highly recommend. Before we left my guide helped me re-bandage my wounds and the guide for the other group asked me if I was OK. I would later find out he was the owner of Gravity! I figured the guy who owned it wouldn’t be doing the rides but there he was! 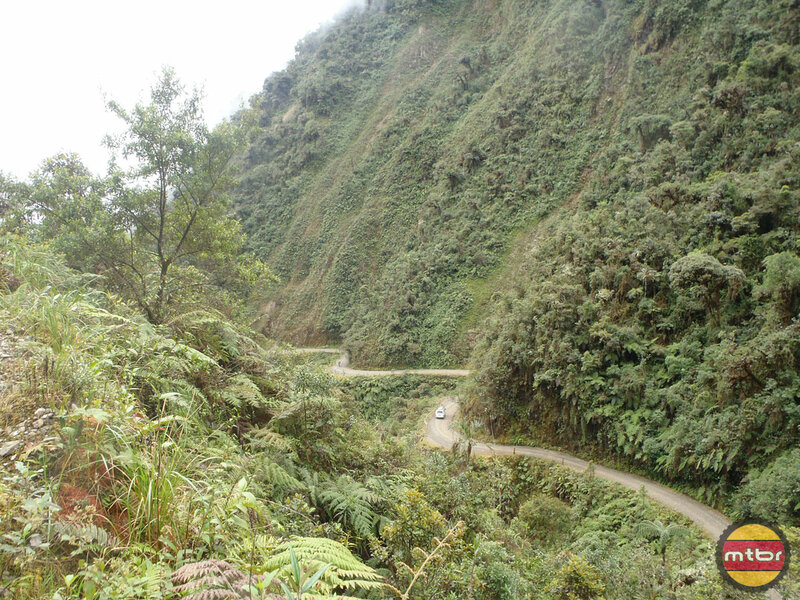 On the way back we drove back up Death Road and it was awesome! The fog had cleared and we could see the drops and places where we had to do weird maneuvers. A few of us bought bottles of beer to drink on the way back, which is legal in Bolivia. For the record our driver didn’t have a drop. Two little kids around the age of 5 were watching our van on the side of the road. One of our guides gave them two chocolate bars and they jumped up and down screaming with excitement. The drive back was 4 hours long, we had an option to be dropped off at our hostels/hotels or go back to the office to pick up our DVD of pictures and videos that was included with the ride! It was the best possible way to be introduced to mountain biking! It was a full on day of exhausting fun with meals and transportation included for just 750 bolivianos or about $110! A total bargain! I recommend this ride to anyone even remotely interested in bikes!